A few months ago, we introduced you to BainUltra’s revolutionary Geysair hydro-thermo massage technology – an incredible way to relax at the end of hectic day. Once again, BainUltra has found a way to take relaxation to the next level. AromaCloud, their newest therapeutic technology, is the first of its kind. Now you can reap the benefits of aromatherapy through this new and innovative system. 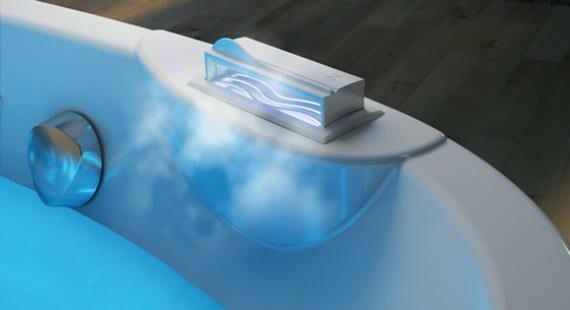 AromaCloud is an essential oil diffuser that can be built into any of BainUltra’s therapeutic baths. Energizing, anti-inflammatory and regenerating essential oils are absorbed more effectively by your body. With AromaCloud, you are able to choose whatever essential oils you’d like to create a calming atmosphere. And like its name, it creates a cloud filled with essential oils that cascade down the side of the tub, and into your bath—creating a calming and enjoyable therapy experience. Monarch’s design team is the first in Canada to have been trained in all of the therapies offered by BainUltra. Are you contemplating a bath renovation in 2013? Drop by the Monarch Kitchen & Bath Centre showroom and speak with one of our designers. We’d love to help.